Have full control over your dog - Use a Dog Training Mat to help your dog learn proper behavior! 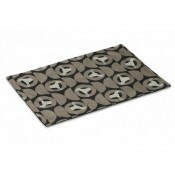 PetHangout offers dog training mats from our Training Collection. You can use a mat to teach your dog a multitude of things. It can be the location where his pee pad resides or the place where he goes when guests arrive or where he goes to rest when he is getting too roudy. A training mat gives you full control over your pet because you teach him or her that this is "home base" sort of speak. Direct them to this location whenever your pet needs it. Fun "loopy" theme - These fresh designs comes in black, green, or tan. Dog poses theme - This is a fun design that your dog will love too. Questions on our training mats? Drop us a note or call 877-860-1278. We will get your answer right away!